Sorry for the delay but I had the same problem with blogger before and I couldn't upload my photos. I am trying agin now before it shuts me down. I want to share one of my cards that I love how it turned out. It is based on the OWH Sketch #84. Enjoy OWH World Cardmaking Day Bloghop today. I am offering a blog candy. Please leave a comment and I will pick a winner on Monday night, October 8th. This is a two-step stamp set from Stampin' Up! This is so gorgeous, Seongsook. I love it when cards have lots of white and just a pop of color. 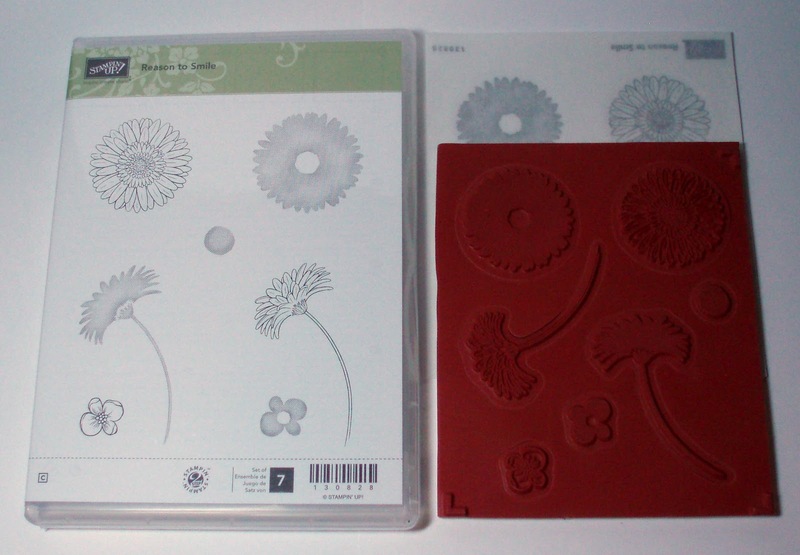 That embossing folder is one I've never seen before. I'm guessing it's a new one from SU? Thanks for sharing! This is really lovely! I love the embossing and the cas design! Fabulous card! I love the color on the ornament and the details!!! Thanks for offering a wonderful stamp set giveaway. Happy weekend! What a beautiful card--love the blue colors you used. THis is sooooo pretty! I love the blue... what a beautiful card you cr8'd & tfs! What a pretty card, thanks for sharing! Happy hoppin'! 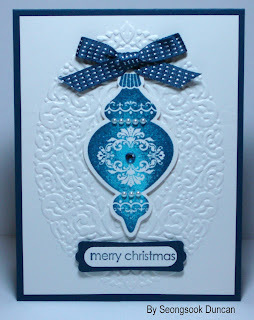 What a stunning card - I love how you've done the blue coloring on the ornament! Very striking, sophisticated design Seongsook! I love the little pearl details and the way you used that embossing folder to create a background that frames your ornament. I am so glad that blogger finally cooperated long enough for you to share this and hop with us today. This is absolutely gorgeous! I love the embossed background and how it frames the ornament. Very classy and elegant card! I wish I thought to use my ornaments. The bit of pretty pearls you added to this. Fabulous inkblending on the ornament! Thank you for a chance to win that beautiful stamp! Love this ornament card. TFS and for the chance to win. this is so pretty - love the colors - don't you hate it when blogger gives you issues. Thanks for all you do for Operation Write Home. Gorgeous card Seongsook! I love the embossing and that beautiful ornament!! 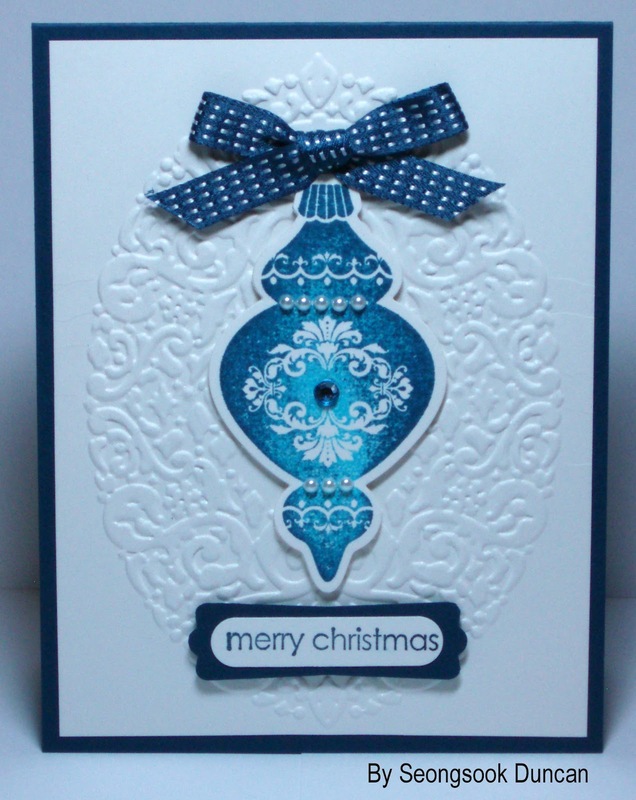 Love your blue ornament- looks stunning on your card. Happy WCMD to you too! Beautiful card!! LOVE the embossing!! That card is so beautiful and formal looking! I love your colors. I'm so glad that you made it to the hop!! I'm always happy to see your pretty cards. Hugs! Beautiful card. I love the embossing and the blue on white. You inspire me to try something similar. A gorgeous and elegant card. Glad you were able to post it. THis is so very pretty! What a terrific idea to emboss and add the ornament. Love it! PS - skip me in your candy giveaway, I have that set! lol! I love the simple elegance that all of the details bring to this beautiful card. I must say that the way you inked the image is my favorite detail, it gives it such dimension. Elegant Christmas card. Beautiful and vibrant color against the pure white. Along with the embossing and layers it sure is lovely! How gorgeous with this die cut and embossed back ground! The blue makes this very pretty! Beautiful!! I love the oval replacing the hard edges of the rectangle. Nice!!! Love the shading on the ornament. Gorgeous card. Love Love Love the ornament card! It's stunning! Thanks for the chance to win!!! Your card is simply stunning Seongsook! I love the blue coloring on the ornament, and the embossing looks fantastic! Nice job!! Anyong haseyo! (please excuse the spelling)Nice use of the embossing, and the use of blue really pops off the card. 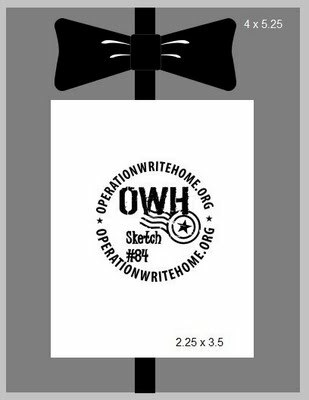 Thanks for supporting OWH. I see the ticker on top-is that for the cards you've created for OWH? Amazing and inspiring, as I've just joined in the fun. I love the blue ornament, and your presentation of it. love the ribbon and embossing. Stampin' Up is one of my favortie companies hope I have a great chance to win. Looked through past post great work. What a gorgeous card. I love that embossed oval, it is the perfect backdrop for the ornament. Thanks for sharing your card (glad Blogger worked) and for the chance to win the Stampin Up set. What a pretty, yet simple card!!! That ornament is gorgeous and I love the embossed background in place of the rectangle. Beautiful card! Seongsook this card is GORGEOUS! The embossing is beautiful and the ornament is simply gorgeous! I hope I can learn to make such beautiful CAS cards. That is my goal!! New follower!!!! Your card is gorgeous -- absolutely stunning! Like everyone else, I love how the embossing frames your ornament, which is so well colored and perfectly embellished. This is CAS at its finest! Thanks so much for sharing! Beautiful card! 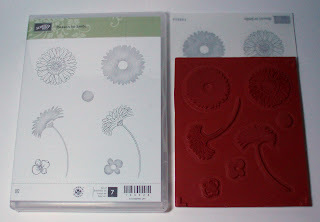 Love that embossing folder done with the ornament that way! And those colors are gorgeous! Please don't enter me in your drawing! Thank you! Wow....this is one beautiful card! I love that oval embossing, the shading on the ornament is amazing, the ribbon and tag are just perfect....wonderful job! Did I see you have created 1 million cards for OWH??? OMG....that is awesome! Just think of the 1 million smiles created when they received their cards!! WOW. stunning & elegant as usual! Stunning card love the colors ! Beautiful card! Love that blue ornament! Love this card. What gorgeous embossing. So glad you were able to post. Beautiful card. Love the use of just two basic colors. Blue and white. Gorgeous card. I love the placement of the ornament inside the embossed design. Stunning card--def. one of my favs of the whole hop! You always do such amazing work!! TFS and for the crack at some wonderful candy!! Very pretty ornament card for Christmas. I like the embossing. WOW! Very elegant! I always enjoy your cards very much! Thanks for all your work for OWH! So very classy and sophisticated! Love the colors! Oh how beautiful! Love the blue and white together! Your card is so dramatically beautiful. The embossing is really stunning. I love the blue of the ornament. Thanks for sharing with us. Beautiful card! I love the blue and white color scheme and the embossing. Thanks for sharing. Absolutely stunning! I love that embossing folder and your ornament is exquisite! Beatiful card, I love how you used the embossing. Beautiful card, I love the way the ornament seems to glow or shine. Very pretty! Great card...navy and white are such classic colors! Perfect ribbon! So glad to see you in the hop, Seongsook! I love your card - it's so elegant. The embossing is so beautifully done. Love this card.